The abstract artworks 'PingHu' depicts a quiet lake in author's heart by using multilayered cover in warm and cool tones. The abstract wall art consists of three panel. We can find a lot of messy brush strokes when we have a close view. And after a distance, we can find every stroke does not miss the integrity of painting. The whole abstract painting seemingly chaotic,but it shows a harmonious tone at a distance by using color gamut and small strokes skillfully. On the right side of the screen,a lot of ocher ,yellowish brown and other warm symbolize the hope of life. Bright orange gives a feeling of sunshine,you can feel the beat of life from the screen, like the rain beating waves and the sun reflecting on the lake ,allowing viewers to feel the inner peace while sitting on the edge of the lake , hovering between fantasy and reality, ambiguous. Due to the handcrafted nature of these panels, each piece may have subtle differences. Dimensions: W 60" x D 1"x H 32"
Frame: Stretch with wood framed（Ready to hang). The framed back is cover by a narrow black satin. Customization: Accepted. Feel free to contact us. Each art comes with a 100% satisfaction guarantee. If you're not happy with it (for any reason! ), you can return it for a full refund any time. If you have any problem, feel free to contact us! 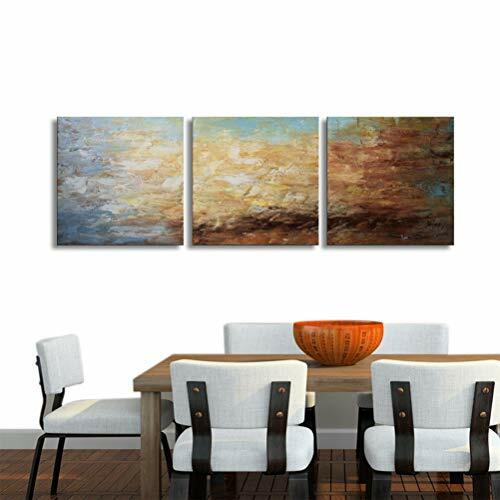 ❤100% HAND-PAINTED TREE WALL Art: Hand painted on canvas,this 3 pieces gallery-wrapped contemporary abstract wall art has a professional look.They are perfect as an home warming gifts idea. ❤READY TO HANG: Hook is already mounted on the stretcher bar to make the placement on the wall more easier! This abstract canvas wall art is ready for hanging as soon as it shows up. ❤ BRIGHTEN UP YOUR WALL: A perfect wall decor idea for home living room bedroom kitchen dining room bathroom bar hotel restaurant office. ❤ 100% SATISFACTION GUARANTEE: Once your abstract canvas wall art arrives, if you're not happy with it (for any reason! ), you can return it for a full refund any time.